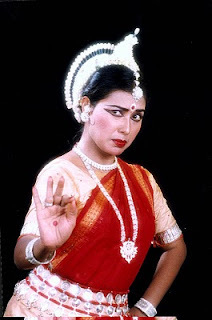 Aruna Mohanty is a senior disciple of Guru Gnagadhar Pradhan and an established dancer of Orissa. She has also received training from Guru Kelucharan mohapatra. She first made a mark in the early 1980s and gained fame for her duet performances with Nandita Patnaik, another leding disciple of her guru. An accomplished soloist, she has a fine grasp of dance technique and maturity in abhinaya. She has particiapated in several festivals and has been assisting her guru in teaching and choreography at the Orissa Dance Academy, Bhubaneswar. She is accompanied in her performance by two bright young disiples of Guru Gangadhar Pradhan: Ramesh Chandra Jena and Madhusmita Mohanty. They are both leading dancers in the repertory of the Orissa Dance Academy. Ramesh is also a teacher in the institution. She will leave Jaipur on 28 August in the morning at 8:45 AM.